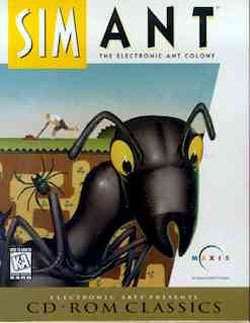 SimAnt is a 1991 life simulation computer game by Maxis focusing on ants. It was designed by Will Wright, maker of other Sim games such as SimCity and The Sims. In 1992, it was named "Best Simulation Program" at the Software Publisher Association's CODiE Awards. The game is essentially a simulation of an ant colony. The game consists of three modes: a Quick Game, a Full Game, and an Experimental Game. It was released for MS-DOS, Commodore Amiga, Apple Macintosh and SNES. The Nintendo version also added eight scenarios, where the goal in each is to eliminate the enemy red ants in various locales, each with different hazards. In SimAnt, the player plays the role of an ant in a colony of black ants in the back yard of a suburban home. The ant colony must battle against enemy red ants. The ultimate goal is to spread throughout the garden, into the house, and finally to drive out the antlions, spiders and human owners. In this respect, SimAnt differed from other Sim games that were open-ended and had no victory conditions. In the Quick Game, the player establishes a black ant colony in a small patch of yard, shown in top-down perspective. The computer opponent establishes a competing red ant colony in the same patch. Underground ant colonies are depicted in a side view. The player has direct control of a single ant at a time, indicated by a yellow color, and may switch control to a different ant at any time (by double-clicking the desired ant). (A little known fact is that the spider in the game can also be controlled by double clicking it.) The player's yellow ant may influence the behavior of other black ants by leaving pheromone trails to destinations such as food and enemy ant colonies and can control the other ants in a limited way (by ordering a certain number to follow it, for instance). The quick game is won or lost when either the red or black colony in said patch is defeated. The player's yellow ant may pick up food and pebbles, regurgitate food for friendly ants, and attack enemy ants. Groups of ant (or yellow ant with his recruits) may attack and kill bigger enemies like spiders, caterpillars, and antlions. Natural hazards include human footsteps, bugspray, spiders, antlions, lawnmowers, and rain, which washes away pheromone trails and can flood the bottom of ant nests. In the Full Game, the player begins with an ant colony in an overhead view, much like the Quick Game. The region of this overhead view is a single square of a map containing a yard and house, and the player wins by colonizing the entire map. The player spreads to other areas by producing young queens and drones to mate with each other. The full game is won or lost when either of the red or black colonies is eliminated. The Experimental Game is similar to the Quick Game, except the player can also control red ants and has access to a set of experimental tools. These tools allow the player to place pheromone trails, maze walls, rocks, ants, and food. The boxed game also comes with a thoroughly researched instruction manual, which not only covers game mechanics, but also contains a large amount of information regarding ants and ant societies. There are a variety of creatures in SimAnt such as spiders, antlions, caterpillars, pillbugs, birds, roaches, flies, and even humans. The roaches and flies can only be found inside the house. The spider, caterpillars, and the antlions can all be killed by sufficiently large swarms. Dead spiders and caterpillars will eventually turn into food. They will eventually be replaced. Dead antlions are not replaced. The ants' caste system in the game is simple. Workers normally make up most of the colony and their jobs are to gather food, dig out the nest, and care for eggs, larvae, and the queen. They also help defend the nest. Soldiers are stronger than workers, and better at fighting other ants; they can do most of the same jobs as workers but need more food and can't care for eggs and larva. The queen ant only has to lay eggs and is the most important ant. In the PC version, 20 queens can be placed in a colony using a glitch (type "qeen"). New queens and males (drones) have wings and their only jobs are to mate and make new colonies. This game never achieved great popularity (except on a small-scale cult level). It was rereleased by Maxis as part of the SimClassics suite. Will Wright, creator of SimCity, SimAnt, and The Sims said he got the idea for The Sims while working on SimAnt. According to the game box, using a statistic from the Software Publisher's Association, more than 100,000 copies of the PC version had sold by April 10, 1992. This page was last edited on 30 May 2016, at 13:54.